Imam Moujahed Bakhach is an accredited family mediator and qualified arbitrator and received his certifications from the University of North Texas. He spent time as an Imam for the Islamic Association of Tarrant County, as well as the Islamic Center of Al-Hidayah. 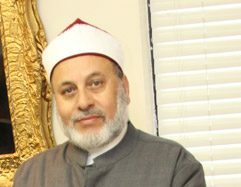 He received his Master’s degree in Islamic law from Al-Azhar University in Cairo, Egypt. Imam Bakhach is a member of the Texas Council on Family Violence in Austin, Texas. Furthermore, he is a chaplain member of the correctional institution, as well as a member of the Human Relations Commission (HRC) in Fort Worth, Texas. He is currently an active member of the Clergy and Peace Alliance (C.A.P.A). Imam Bakhach has written booklets and manuscripts on family issues, Ramadan, and more. Imam Moujahed Bakhach has over 30 years of experience w lecturing at different institutions. I. Certified Mediator & Negotiator ADR (Alternative Dispute Resolution), 2009 by UNT (University of North Texas), & Religious Arbitrator. November 2009, award of recognition by the mayor and the city council members of Fort worth for serving 7 years as member of HRC (Human Relation Commission).